Vacuum is not a priority in slaughterhouses. Independent from the sort of animal, the meat preparation process starting from alive animals must first face severe issues regarding their production. Ethical, medical and hygienic concerns anticipate practical problems. Whatever the cultural frame is, several liquid ring pumps where replaced by a vacuum system of Pneumofore to improve the evisceration process. 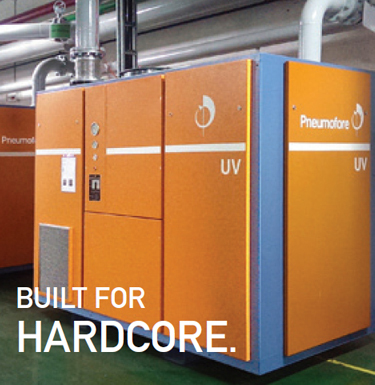 Results are: the reduced power consumption, the abolition of cooling water, less noise and the constant vacuum level. Interiors are almost liquid, their quantity depends on the animal to eviscerate. The commonly used vacuum technology is the liquid ring one. Slaughterhouses separate the meat from the other internal components of the animals. When the process is continuous, the vacuum supply determines the speed and efficiency of the evisceration. The evacuated media is separated in various filtration steps, gravity alone keeps organs on the bottom of receivers, while liquids are pulled higher. 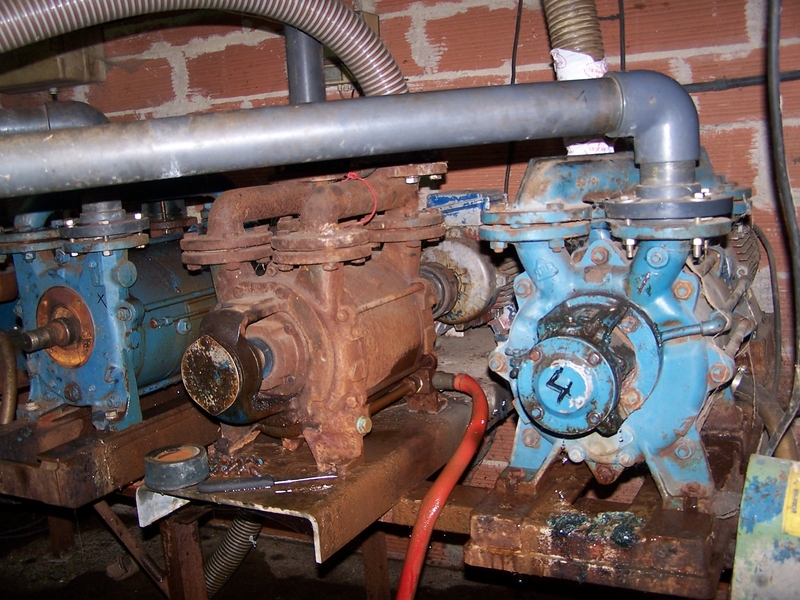 No matter which kind of vacuum pump is installed, the liquid must also be completely separated. 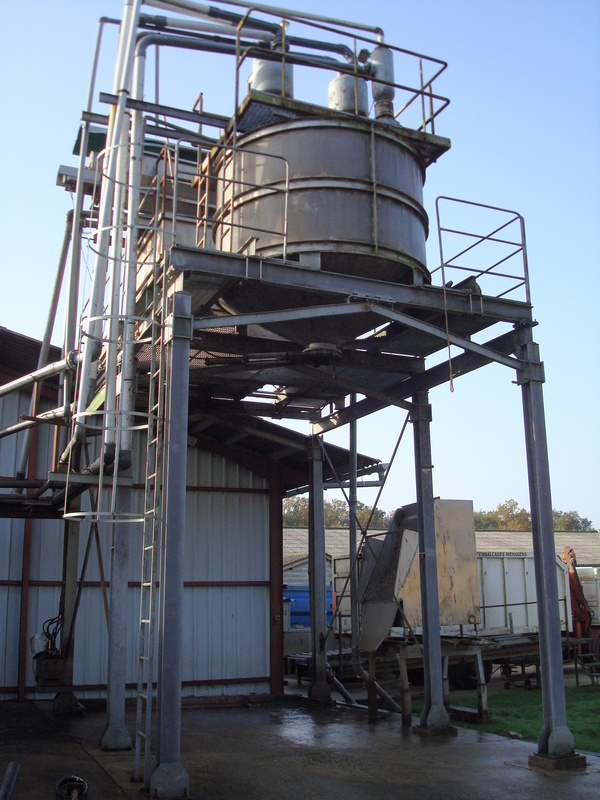 This happens by means of a “barometric tower”, which holds back anything but air, thus separates solid and liquids from the final suction media. The height of this separation unit is 10 meters or more, see picture 1. The existing system was already operating correctly. 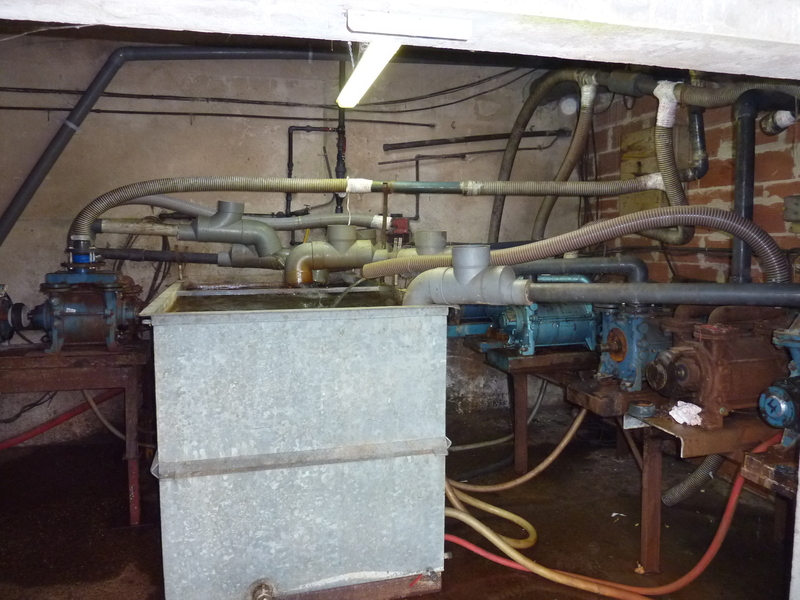 The analyzed installation is in France and the previous liquid ring pumps had been running for years. However good the separation tower is, at the operating pressure of 200 mbar(a) (5,9 in. Hg), some moisture or humid gas reaches the pumps. This moisture influences the operation of the pumps and their efficiency suffers due to the ‘polluted’ cooling and sealing liquid. Sometimes to the point that fresh water is used to run the liquid ring pumps. 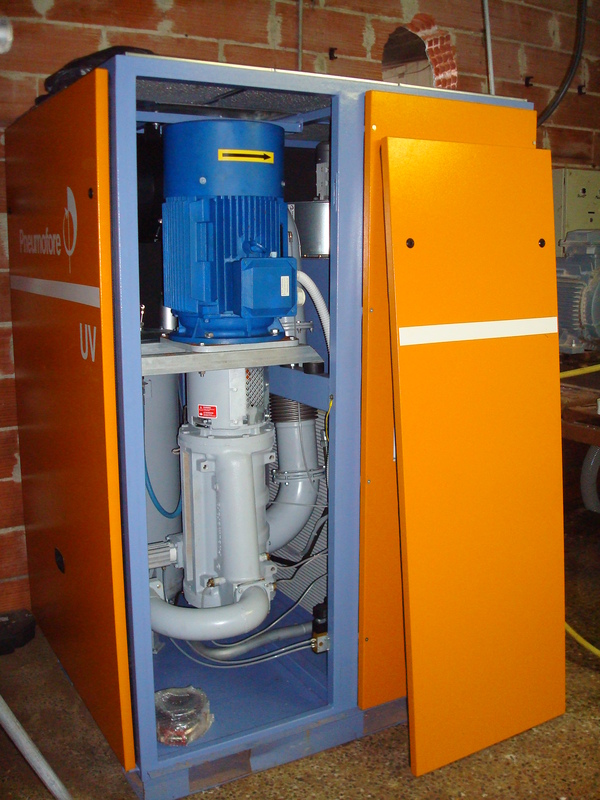 The installation of 2 units model UV16 H, which are air cooled rotary vane vacuum pumps, differs from the previous water cooled system in various aspects, see picture 2. First visually, as the UV16 pumps are enclosed in a canopy, which also contains the control and power panel.Previously, several smaller liquid ring pumps were installed with less order, see picture 3 and 4. The water leakeges and the noise did not create a friendly environment. The power consumption was reduced by 40% and no cooling water circuit is required anymore. 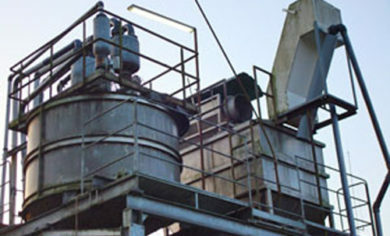 The competent collaboration of our local distributor with Europe’s largest producer of quail having a farm with more than 25 million quails and about 80 million quail eggs per year, resulted in this improved centralized vacuum system, offering a short return of investment, mainly due to the savings achieved with the reduced electrical power consumption and the abolition of cooling water usage. 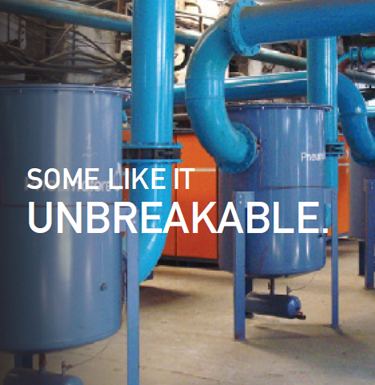 For this successful project, the key was the experience in separation processes. 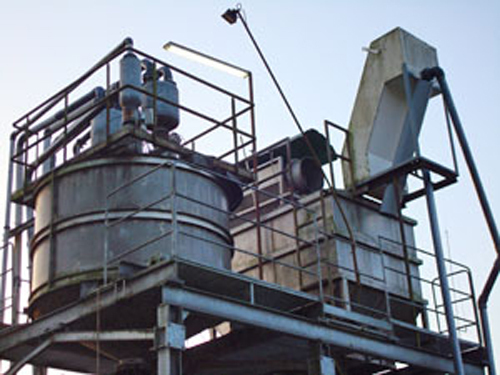 In this case several additional receivers were installed, combined with multi-stage solid liquid separators and specifically designed inlet pre-filters. 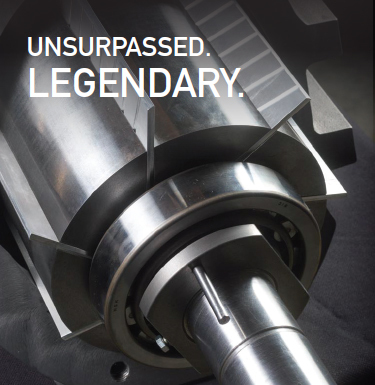 With start-up in 2009, this vacuum solution is performing at full customer satisfaction also now after almost one year of continuous operation.